From 1941 to 1944 some 50,000 to 70,000 people were shot to death in the pits located at the mass killing site in Paneriai. Most of the victims were Jews. 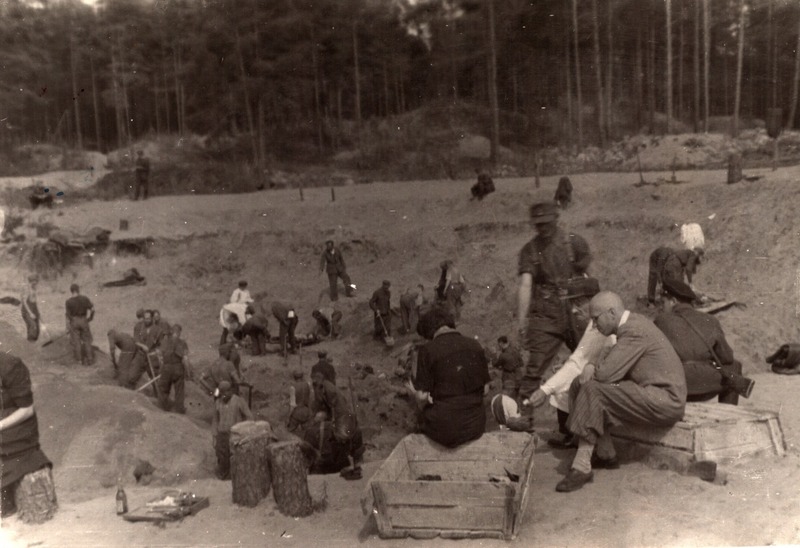 The photograph captures the exhumation works performed by the Special State Commission back in 1944. When the works started, quite a crowd of the population of Vilnius gathered around the exhumation sites in Paneriai. The press of the time wrote: ‘Thousands of inhabitants from Vilnius flock to the death camp. People gather around the pits. Everybody watches the dead bodies being uncovered [...]’. The Special State Commission exhumed some 486 bodies from the pit, but according to the data provided by the Commission a total of 9,000 people had been shot to death in this pit. In the 1950s the pit on the photograph was evened up. Therefore, in 1985 after the rearrangement project of the Paneriai Memorial Site as prepared by Janutis Makariūnas was in part completed, the pit was left unmarked and the exact location of this mass grave remained unknown for many years. However, as a result of archeologic, geophysical and historical research of the museum’s territory in Paneriai, the location of the pit was identified and duly marked alongside with other previously unknown objects.